30 x 30cm oil on board. England is known for it's dreary grey days. The greyest and foggiest of these days are called pea soupers, when the fog is so settled and thick that you can barely see a few feet in front of you. 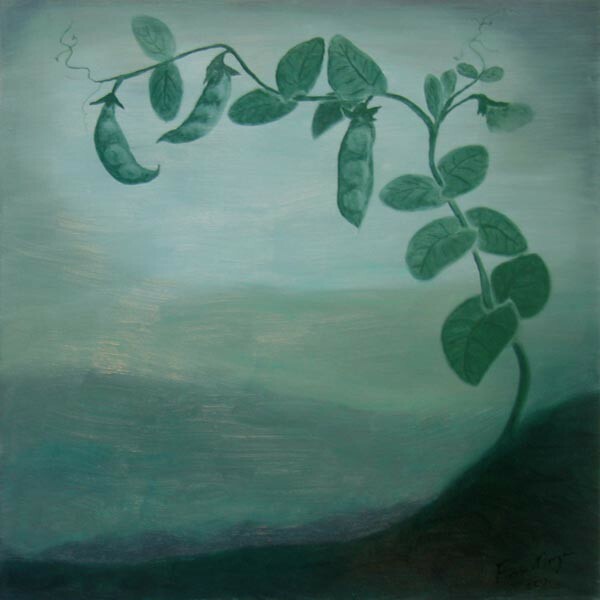 This painting is an interpretation of a 'pea souper', with a nod to the lovely misty and ethereal tree paintings of Melbourne's Kathryn Ryan. Original artwork for Autumn and Winter paintings can be purchased in the Official Art Store. To be kept updated on the availablity of Spring and Summer paintings, get on the mailing list, yellow box top left. This recipe is an inspired conglomeration of several pea soups I have known and enjoyed. The first was a family recipe for your bog standard Pea and Ham soup. Very flavouful, somewhat missed once I stopped eating meat. The second was another family recipe for a Pea and Mint soup which was interesting for it's enormous use of mint, but not outstanding in itself. And finally there was the Ainsley Harriet cup-o-soup version of Shropshire Minted Pea Soup from when I was working in London. Drinkable in a cup-o-soup kind of a way, it caught my attention with it's unusual spice and tang. Unfortunately this was due to the inclusion of the world famous Worstershire Sauce which contains anchovies and I stopped drinking this once I realised. But then it was game on to create my own Pea soup which was flavourful like the Pea and Ham, super minty like the Pea and Mint, and tangy and spicy minus the anchovies like the Shropshire soup. Success below! Saute the onion in butter until soft with a little pepper and salt. Add stock, split peas, bay leaves, 1/4 cup balsamic vinegar, and two big pinches of hot paprika. Simmer gently with the lid on until the peas are completely broken down. This means at least for one hour, and preferably, for two hours. Taste test. Check for heat/spiciness and cautiously add more hot paprika to suit. It's heat will vary depending on it's age (less heat with age). Also check for tartness/tang. Depending on the balsamic vinegar and your tastes, you may want to add more to suit. Finally, stir in all the roughly chopped mint. Makes 4 rather hearty bowls.